June is typically strawberry season in our parts. But due to the extended winter and the snow on the ground, strawberries here did not make an appearance until mid-June, so the season extended itself into mid-July. This year we went strawberry-picking to an amazing farm which was growing multiple varieties of strawberries, but more on that later. I love strawberries in every way, but I have to say that strawberry milkshake was never my favourite. The tartness of the berries just don't seem to sit well with the sweetness of the milk. 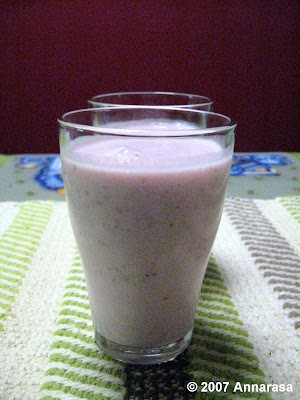 But, as it is one fruit milkshake that my dear husband truly loves, I blend it in different ways in order to bring some more balance to the flavour. One spice I find goes beautifully with strawberries is crushed green cardamom. It adds a certain je ne sais quoi to this blend which I recommend serving without ice and chilled. Place all the ingredients in the blender and whick until smooth abd frothy. This deliciously sweet milkshake is also my contribution to Linda of Got Milk? who is spreading awareness about World Breastfeeding Week which is celebrated annually in the first week of August. The milkshake looks so delicious and refreshing!!! Never would have thought about combining strawberries and cardamom but I love them both a lot so your milkshake has made me very curious about the taste :) It must be delicious! Thanks for your entry to Got Milk? I'll do a round-up after August 7th. I wouldn't have thought of strawberries and cardamom together either. Sounds intriguing, though.